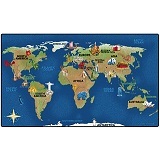 Carpets for Kids® is the industry leader in high-quality, educational area rugs. Established in 1992, they are a major supplier of children's educational rugs for daycares, schools and homes across the country. Amazing colors, both bright and in a earth-tone tranquil palette, and innovative designs, make CFK a great choice for quality children’s rugs. 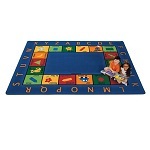 Learn the alphabet on the iconic Sunny Day Learn & Play carpet, or create a neat floor seating area for circletime with the Color Blocks rugs. 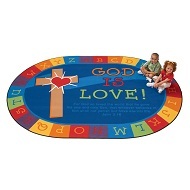 Carpets for Kid's goal is to provide all educators with a quality tool to enhance learning for young children. They strive to have the best classroom carpet designs and highest quality products out on the market. The CFK Premium Collection features their best quality of carpet pile and backing. These classroom carpets feature 24 oz. face weight and come with a Lifetime Abrasive Wear Warranty. For a long-term school or library flooring investment the Carpets For Kids Premium Collection is the way to go. 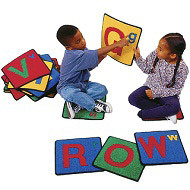 For the softest classroom rug, Carpets for Kids now has a KIDSoft carpet series designed for infant rooms and nurseries where only the softest play rugs will do. They feature smaller strands for fiber, or a lower denier per filament which can be compared to high thread counts on Egyptian Cotton sheets. These fall under the Premium Collection and feature the same Lifetime Abrasive Wear Warranty offered by Carpets for Kids. With only a lower face weight of 12 oz., the ValuePlus carpet line from Carpets for Kids is their better buy. These durable rugs still feature the same KIDply backing as the Premium Collection, but are at a lower price point with a 5 year Abrasive Wear Warranty. 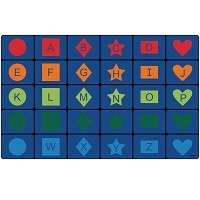 A good option from Carpets for Kids is their affordable line of KID$ Value Rugs™. Same great colors and fun new designs, at a price that fits any budget. Carpets for Kids Value Rugs have skid-resistant waffle backing and are machine washable making them easy for teachers to keep clean without having to request special vacuums from school maintenance. CFK Value Rugs feature a 1 year Limited Wear Warranty. Carpets For Kids® helps keep our planet green by reducing landfill waste. From solid color rugs to carpet seating squares, they send production scraps and damaged goods from their area rug manufacturing facility to a nearby recycling center. Annually they recycle an average of 115 tons worth of material. In addition, Carpets for Kids® pays a premium to process this material for recycling and will continue to be committed in fulfilling our environmental objectives. All Carpets for Kid's rugs are 100% lead free and safe for children of all ages, and they're 100% American Made!